The measure’s author says it’s only a matter of time before it becomes law. A slew of so-called good government bills cleared a critical legislative hurdle this week and are poised for final approval next week. 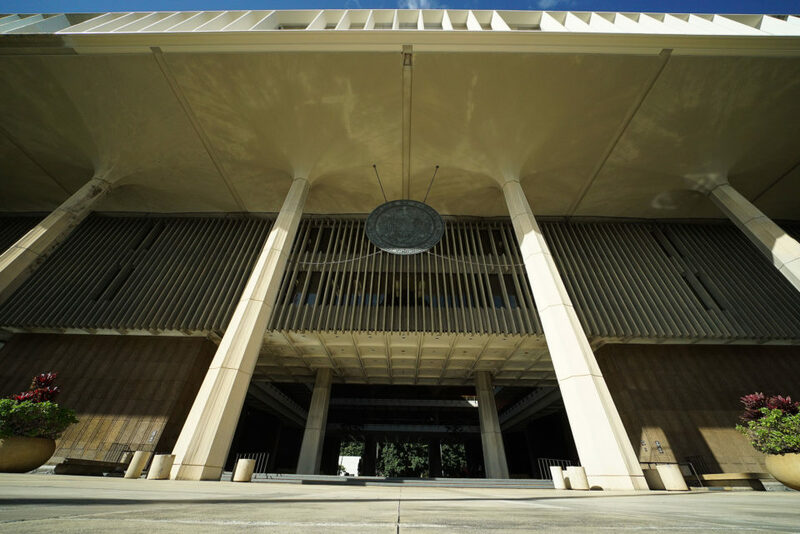 But the measure that arguably would have had the most significant impact on Hawaii’s democracy did not make it across Friday’s deadline for bills to advance. House Bill 1401 would have enacted voting by mail uniformly across all counties for all elections in 2020. Janet Mason of the League of Women Voters and Corie Tanida of Common Cause wait for the conference committee decision on the vote-by-mail bill. 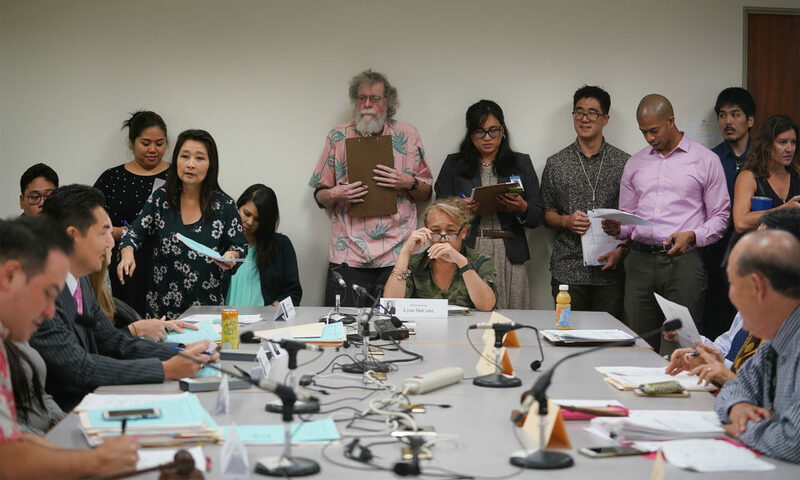 Rep. Scott Nishimoto, the lead House conferee on the bill as well as its author, told his counterpart, Sen. Gil Keith-Agaran, shortly after 5 p.m. that both lawmakers agreed on many aspects of the bill. 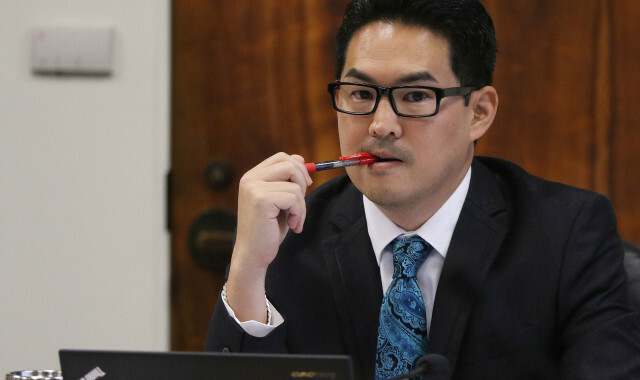 But Nishimoto did not get clearance from House leadership, and so HB 1401 will have to wait until next year. It’s the third year in a row that a vote-by-mail measure has failed to make it out of conference committee. 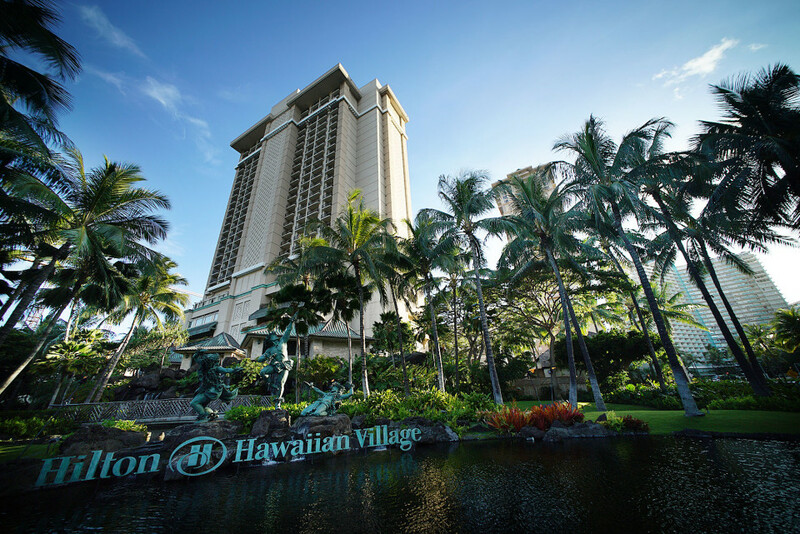 Hawaii’s voter turnout is mired at the bottom compared with other states, and lawmakers and good-government advocates have been embarrassed by the distinction. 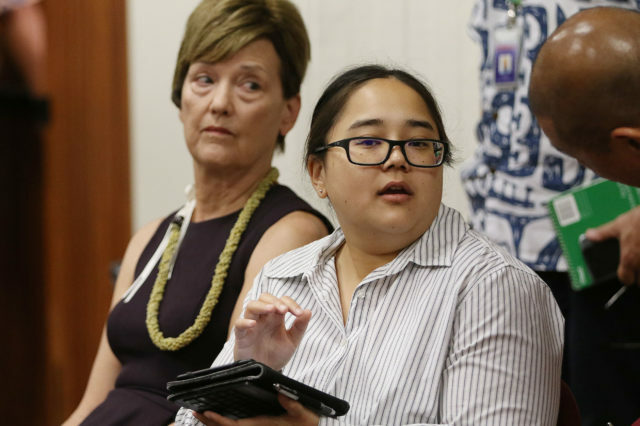 Testimony in support of HB 1401 came from the state Office of Elections, the Office of Hawaiian Affairs and the clerks’ offices for all four counties. Lawmakers themselves also recognize that the trend among local voters is to increasingly vote by mail rather than trudge to polling sites. Corie Tanida of Common Cause Hawaii and Janet Mason of the League of Women Voters of Hawaii, two prominent good-government groups, were the lead proponents of the vote-by-mail bill. Like political candidates, they had prepared separate press releases in advance depending on the outcome of the bill’s fate. “Our Legislature missed another opportunity to improve voter turnout, ignored the advice of election officials and most importantly ignored the wishes of voters — the majority of whom are already voting this way,” said Mason. Other bills were approved to address things like enforcing ethics laws that regulate lobbyists, and providing more information about who is spending money in political campaigns. House Bill 508 calls for updating and streamlining administration and enforcement of the state Code of Ethics and lobbying laws by increasing possible penalties should the law or code be violated. The State Ethics Commission, which backed the bill, would also be authorized to settle such cases. Nishimoto also authored the ethics bill, and a related piece of legislation, House Bill 511, which does several things. It clarifies the laws governing lobbyists by amending the definitions of “expenditure,” “lobbyist” and “lobbying.” It also allows a former employer of a lobbyist to file a notice of termination of employment. Rep. Scott Nishimoto is chairman of House Judiciary Committee and the author of the good government bills. 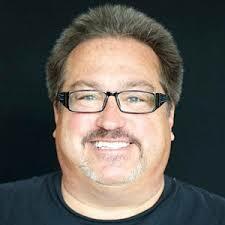 Lobbyists registration statements would also have to be posted on the Ethics Commission’s webpage “within a reasonable time” after they are filed, and the posting will remain on the website for at least four years. Any violation could results in penalties, which under the bill could be as much as $1,000 per violation, a doubling of the current fine. Nishimoto, who is chairman of the House Judiciary Committee, also introduced House Bill 852. The bill, once law, is expected to save the Ethics Commission money by allowing it to notify individuals that fail to file their financial disclosure statements by in-person service, email, or first class mail, rather than by the “registered mail, return receipt requested” method. Failure to file on time could also result in a fine, which would be increased from $50 to $75 and an additional $10 for each day the delinquent filing continues — “a stronger incentive” to do the paperwork on time, lawmakers concluded in a committee report on HB 852. 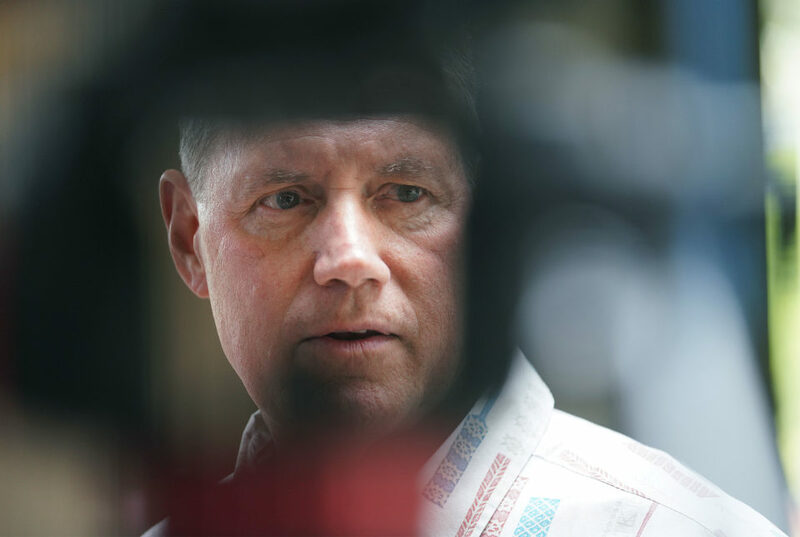 Dan Gluck, the Ethics Commission executive director, said he was “very pleased” with the Legislature’s “thoughtful consideration” of the bills. 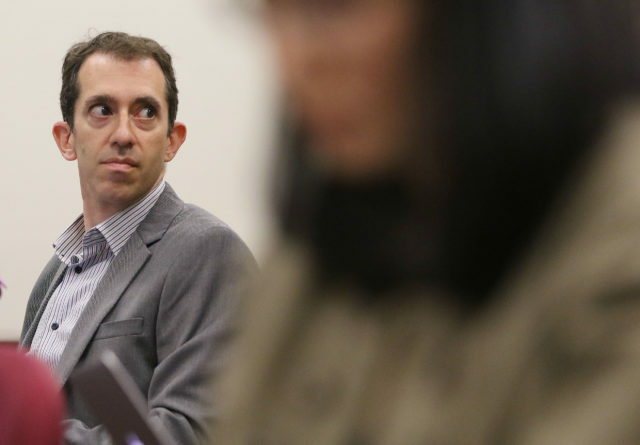 Dan Gluck of the Ethics Commission at Thursday’s conference committee deliberations on ethics bills. Two measures that are part of the state Campaign Spending Commission’s legislative package also made the cut. House Bill 279 would make clear that someone who distributes or republishes certain types of campaign materials — such as fliers or advertisements — would not be considered to have contributed to a campaign. Another measure in the package, House Bill 281, requires the commission to post on its website the names of all non-candidate committees that fail to file a report or to correct a report within two weeks of receiving a notice. “Non-candidate committees” refers to a wide range of organizations involved in political campaigns, including labor unions and political action committees.